Local children race to find the eggs at a past Easter egg hunt. Treasure hunting captivates folks of all ages, and let’s face it, kaleidoscope colored eggs are as alluring as any loot imaginable for youngsters. The largest Easter egg ever created stood more than 25 feet high and weighed 8,000 pounds. The goliath was made out of chocolate, of course, and had to be supported by a steel frame. Now there’s an egg that would have been easy to spot. Believe it or not, Easter is just around the corner again, so grab a basket or bucket and check out these local events. 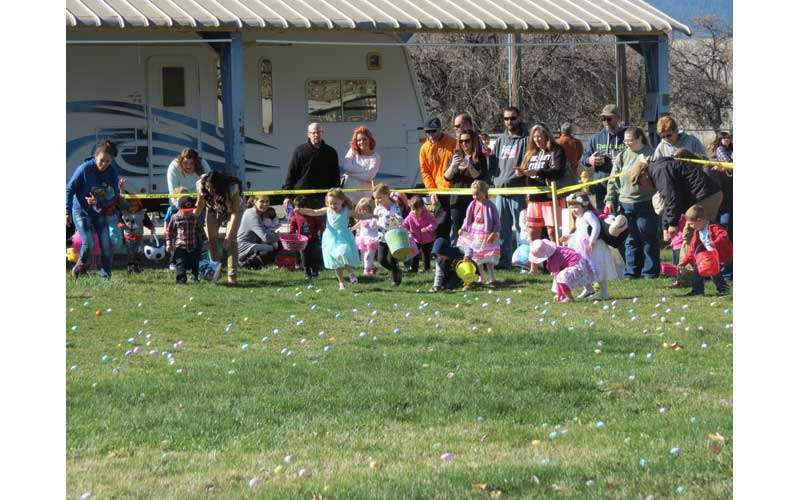 The Easter Bunny is making an appearance at the Lassen County Fairgrounds for the annual Susanville Community Easter Egg Hunt starting at 8:30 a.m. Saturday, March 31. Groups are divided by age, with hunters aged 2 and under kicking off at 9 a.m. followed by 2 to 4, 5 to 7 and 8 to 10 at 10 minute intervals. Prizes are provided by the Susanville Soroptimists and include one gold egg among each hunt to be redeemed for the prize of a goodie basket overflowing with treats. 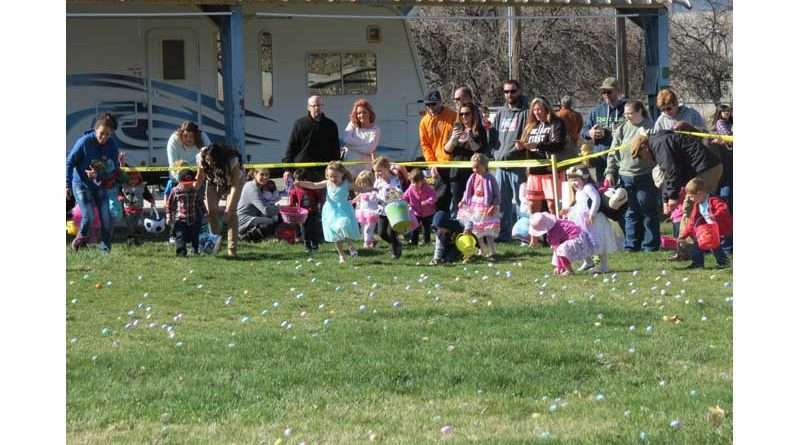 This community Easter Egg hunt is being sponsored by C&S Waste Solutions, Smith Properties, SusanvilleStuff.com, Susanville Sunrise Rotary, Les Schwab Tires, One Stop Office and Nobles Construction Components. Additionally, Valley Christian Center located at 1401 Riverside Drive holds an Easter Service at 10 a.m. Sunday, April 1, which will be followed by an Easter egg hunt immediately afterward for children up to the sixth grade. For more information, call 257-2210. Westwood’s second annual Easter Egg Hunt will be held at 1 p.m. Sunday, April 1 at the Westwood Park. Families are advised to arrive 10 minutes prior so the children can be divided into age groups, and are encouraged to bring their own containers for the hunt. 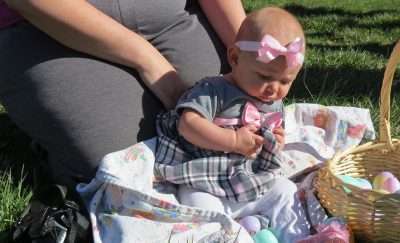 Emma Moore, then 4 months old, attends her first Easter egg hunt in Susanville. Chimney Fund hosts this event. Luckily, if you miss one of these events, the Easter Bunny is taking an extended break to rest his legs before hopping over to Sacred Heart Catholic Church to disperse another round of Easter delights for toddlers through sixth grade at noon Sunday, April 8. The little ones get to wear their Easter duds twice this spring, how cool is that?